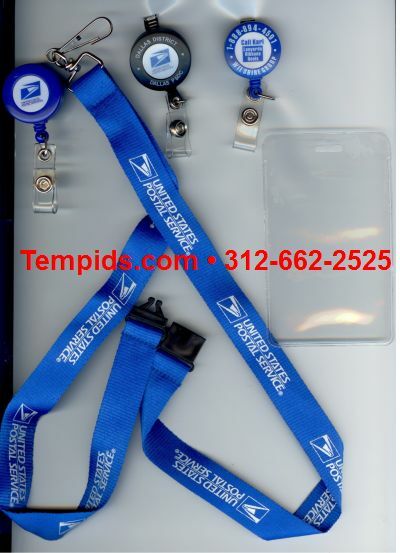 TempIDs.com is a producer of quality lanyards and badge reels and we worked with the proper division within the United States Postal Service to get approval on the correct design for USPS lanyards. The department indicated that there has been too much misuse of the USPS logo. After numerous designs and revisions we now have the correct design of USPS lanyards. Tempids.com works with postal facilities across the country with USPS lanyards and USPS badge reels. There are several approved color combinations for the USPS lanyard, but the dominant choice of USPS facilities is the USPS blue with white imprint. This United States Postal Service lanyard is printed on both sides of the fabric, has break away that falls on the back of the neck, and a swivel hook attachment. It is 7/8" wide and includes the required logo placement. Everything is produced according to postal regulations. The same goes for the badge reels. Pictured to the right are the "generic" USPS badge reel and a custom badge reel. left) is custom printed in the center only with the correct USPS signature logo. The black badge reel is custom printed in the center and on the shell. The black badge reel has the USPS facility site name printed on the shell which is a nice touch.Printing on the shell is a service that few badge reel producers can do. We tend to have the pictured USPS lanyard in stock so you can receive a quick turnaround. We also do our best to have the custom USPS badge reel with printing on the center only. Printing on the shell requires a minimum of 500 reels. The price for the USPS custom reel with printing of your facility location on the shell is $1.85 each and a $50.00 set up. With the custom USPS badge reel you also receive your choice of clip attachment on the back -- standard or alligator clip. A digital proof is provided prior to production for your approval. Since we tend to have the regular blue USPS badge reel and USPS lanyard in stock, you receive them within a few days of ordering. Single USPS Badge Reels are $4.99 each. We ship them USPS Priority Mail of course. Please note that the USPS lanyards and badge reels that we offer are the approved design and application of the signature logo. Order USPS Lanyards and USPS Badge Reels as a set and save. Minimum order of 1. Each set contains one USPS lanyard and one USPS badge reel. USPS lanyards and reels in stock.